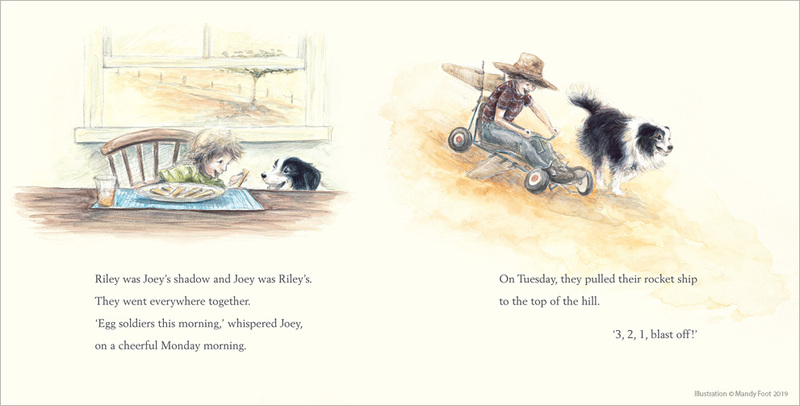 I'm both proud and pleased to share my first picture book as Author and Illustrator. Yes I can now call myself an 'Author' as well! Beautifully published by Hachette Australia in hardback, paperback and e-book, it will be released in June 2019. However you can pre-order via the link below. Available for Pre-Order NOW from your local bookstore or simply follow the links below. TEACHERS RESOURCES are available here. 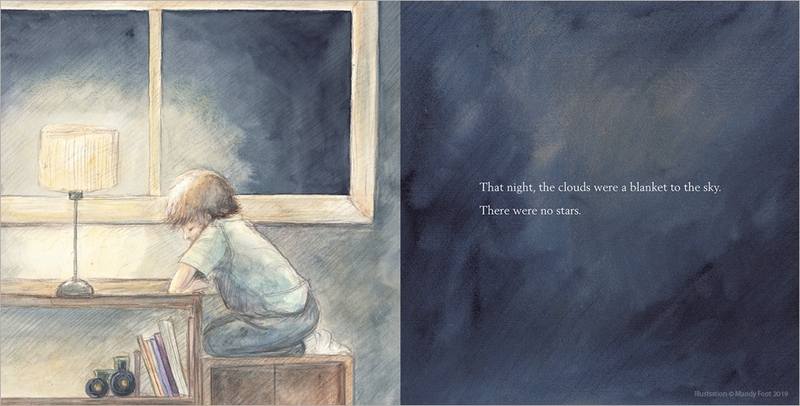 The illustrations for this book were created with graphite pencil and watercolour paint. Coloured pencil and chalk pastel pencils for highlights. 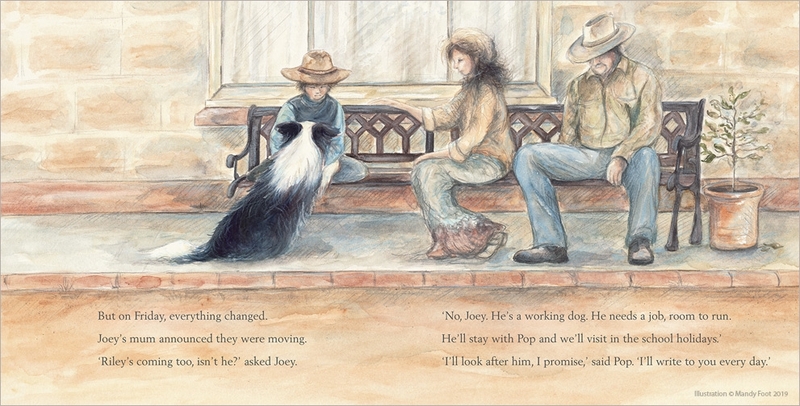 Inspiration for 'Joey and Riley' came from my own family's personal experience having Border Collies. When I was little my Dad was a stock agent and we had a Border Collie named Prince. He was very much a working dog and would work at the stock yards back in the early 70's until he got a grass seed in his ear and couldn't hear. I heard once that the breed of dogs you have as a child very much influences your choices throughout life. In my late teens when I wanted to get my own dog (and still living at home) I asked Dad for my own Border Collie but he wouldn't let me - they were working dogs. So I got a Blue Merle Collie named Kippy (looked like a Lassie dog only black, white and silver grey). The sweetest natured dog. The years passed and so did Kippy unfortunately and I finally moved out of home. Then I got my first Border Collie. I did take note of Dad's advice though. There are Border Collies and there are Border Collies. I went to a breeder who had the 'show dog' lines bred more for temperament as great family pets not strong working, farm bred lines - there is a big difference. Cody was this dog and he was the most sweet natured and my constant shadow. But he totally reconstructed my back yard when I had a daytime job so what did I do? Went and got another of course! Against my Dad's wisdom I found a gorgeous (fell in love instantly with) pup in the local fodder store - a chocolate brown fluff ball, Border Collie x Kelpie I named Mav. He was farm bred and very busy. He was instantly Cody's best friend and Cody stopped his landscaping obsession but Mav certainly wasn't happy in the town. When we were able to move to a small farm Mav's true personality finally came out and he was not only happy but such a wonderful companion. These were the dogs that were my family when my son was born. They were always there. When they eventually passed of old age Joshy was only 3. I had a hard time explaining this to him. He especially missed Cody terribly. They say that dogs only live for a short time as they already know how to give unconditional love. For us people it takes a little longer. Now we have another Border Collie in our family, Arty, from the same breeder as Cody and he is a bit of a superstar at our local school. He is even more my shadow which I never thought would be possible and he would very much follow me to the ends of the Earth. The best part is, I work from home now so Arty has no need to reconstruct my garden! He sleeps alongside my computer desk when I work and alongside my drawing table when I paint. He also reminds me when it is time to feed the horses! Now Arty has been through all his obedience training and has just turned two, he has a new little buddy named Rory (another Border Collie) to keep him more active so he doesn't sleep all time when I am working (there is very little working instinct in Arty in case you hadn't gathered). Plus he is teaching Rory all the good habits that he has learned. They are the most loyal companions and very much part of my family just as we are family to them. Although this story is fiction, elements of it are taken from our personal experiences. The best part of writing stories is that you as the author have the power to make anything happen and turn something in life that may be sad, into something happy. So that is exactly what I did.